We’d love your help. 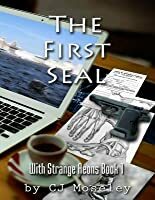 Let us know what’s wrong with this preview of The First Seal by C.J. Moseley. To ask other readers questions about The First Seal, please sign up. Another one of my own books, written for Thriller readers with a hint of Cthulhu mythos. This first book touches on themes and events from Lovecraft's world, but remains firmly centered on human protagonists and antagonists. It has themes about slavery, sexual abuse and genetic engineering that may be harrowing for some readers, but fits right into the Thriller genre. Born in the Welsh Marches of Shropshire and trained as a Physicist and Multimedia Programmer, worked in theatre, audio engineering, the games industry before becoming a Web Developer and recently an Independent Science Fiction Author.